Lay out the paver edging next to your bluestone pavers (or whatever paving material you have selected). The edging is that strip with holes at intervals. You will see what the purpose of the holes is on the next slide. Note that this product is not the same as lawn edging. Both have "edging" in their names, but the two have entirely different functions. These differences are reflected in their appearance (for example, lawn edging typically does not have holes in it). The purpose of paver edging is to hold pavers in place. There are flexible and rigid types. The rigid type is meant for a straight edge. But what happens when you have a circular patio, for example? That is where the flexible type comes into play. 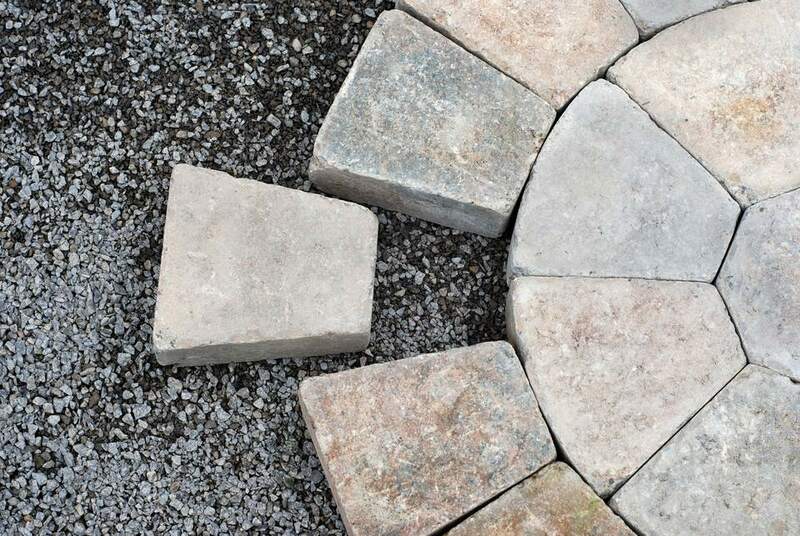 If your project has both straight and curved edges, you can connect the two types (assuming that you stick to the same brand of paver edging). To keep grass stolons from invading areas adjacent to the lawn. To give your lawn a more finished look. Drive the spikes completely into the ground. This will lock the pavers in place. After the excess is removed and all the spikes are driven in, cover the edging for your pavers with loam or mulch so that all you will see when you are done is the new patio or walkway. There are different kinds of edging for pavers available, but all kinds serve the same purpose, which is to keep your paving material in place. Edging is a very important part of installing pavers. Whether you are installing paving made of stone, brick, or concrete, you will want to use edging along the perimeter of your project. While there are some metal kinds available, paver edging is usually made of plastic (you will never have to worry about having it get rusty on you). Most kinds of edging for pavers are functional only; they will not be seen after installation, so their appearance is not a factor. Thus, the dislike people feel toward plastic edging (because they do not like the appearance of plastic, preferring the look of materials such as brick, wood, or metal, instead) in the context of edging for a lawn is not relevant here. Like an umpire in baseball, you know that paver edging is doing its job well when you are least aware of its presence. Does Crushed Gravel Make a Good Driveway Material?